Mitchell Pass and the city of Mitchell, Nebraska, derive their names from a military post built near here during the Indian Wars. No trace of the sod structure remains at the site on the North Platte River bend northwest of Scott’s Bluff. It was named in honor of General Robert B. Mitchell, who ordered the establishment of several sub-stations along the Great Platte River Road between Julesburg and South Pass. Fort Mitchell was constructed and manned in autumn 1864 by Company “H” of the Eleventh Ohio Volunteer Cavalry under Captain J. S. Shuman. In February 1865 they helped defend Mud Springs Station against an attack by Cheyenne. In June the post provided relief for Fort Laramie troops ambushed by Sioux near Horse Creek, and that summer chased Indians who tore down telegraph lines and attacked wagon trains and stagecoaches. Army records are meager, but there are eyewitness descriptions of the fort by Eugene Ware, John Bratt, and Margaret Carrington. An official ground plan and a sketch of 1866 by William H. Jackson reveal a stockade with sally-port, firing loop-holes, and a sentinel tower. A nearby “road ranch” served as the Scott’s Bluff stage station. Fort Mitchell was abandoned after the Fort Laramie peace conference of 1867. 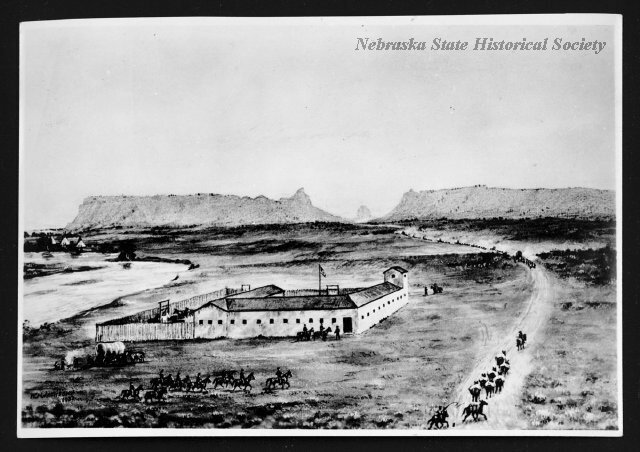 “Fort Mitchell, 1864-1867,” Explore Nebraska History, accessed April 19, 2019, https://mynehistory.com/items/show/462.